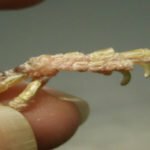 Parasitic mites pose a serious threat to the health of cage birds, and some can even affect bird keepers. The most familiar parasites are the Red Mite and the Northern Mite, but lesser known species which affect our birds include the Scaly Leg Mite, the Canary Lung Mite, and the Grain or Flour Mite. In the annual battle with these pests, there is no ‘final solution’; fanciers may go for a year or two with few problems, but the war is never-ending, and it is vital to understand the enemy. Mites are among the most successful animal groups on the planet; 45,000 different species have been identified, but scientists think there may be over a million species out there! They have been around for 400 million years and have colonized the planet from its depths, 15,000 feet down in the ocean, to its heights, 20,000 feet up in the Himalayas. The numbers are beyond counting; a single bag of leaf-mould gathered from any oak-wood will contain over a million mites from 50 different species, and hundreds of species will be found your local park, pond or gardens. For treatment in the home, I recommend you frequently vacuum all carpet and upholstery and dispose of the bag or vacuum contents in a sealed bag outdoors. Use food grade diatomaceous earth dust in all cracks and crevices around the perimeter of the bird room. Apply a thin coat of food grade diatomaceous earth dust to rugs and carpets. Rake (not sweep) nap back and forth, causing dust to enter rug or carpet. Let product sit overnight. Repeat application as necessary and vacuum every 3 – 4 days for effective control. Diatomaceous earth dust does not have a fast knockdown; it can take several days for insects to die after they contact the dust. Put all clothes through the dryer on high heat to help kill mites and their eggs. Food Grade Diatomaceous Earth given to your birds in the form of a dust bath! Some bird owners are cautious and cover their birds head while they sprinkle the dust on them. I let them roll in it, and I have never had any problems. You can ask your vet which method you should use. Diatomaceous earth can be mixed into the seed, to control bugs at a rate of 1 cup per 50# of seed. Mites are also found much closer to home. They thrive in carpets, mattresses, duvets, and pillows where they feed on flakes of human skin; many asthma attacks are triggered by domestic dust-mites. It is almost certain that some mites are actually living on your body as you read this article! One tiny species lives in the hair follicles of our eyelashes – where it feeds on fats and generally causes few problems. But if you have ever had a stye or ‘blame’, it was probably the result of mites romping among your eyelashes! The grain mites, flour mites, and cheese mites were better known to our grandparents, whose larders they infested. Fridge’s and better food storage have reduced them to a level where we scarcely notice them in the home, but they are still around and can cause lung and skin complaints, due to the allergies which they trigger. If either you or your birds are wheezing – it could be flour-mites living on waste foods in the cage sawdust. At harvest time, people and dogs may be affected by the bites of ‘harvest mites’ which can cause painful rashes, and eczema. In earlier generations, bakers and grocers often suffered from ‘grocer’s itch’ caused by flour-mites or cheese- mites biting their hands. Today, grain and flour stocks are regularly sprayed with insecticides to control such mites, which in itself raises health issues. 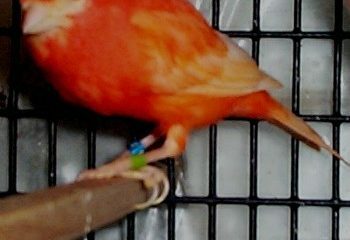 Bird-keepers are most familiar with the Red Mite, whose scientific name Dermanyssus Gallinae, literally means ‘the chicken-mite.’ This blood-sucking parasite of poultry and cagebirds attacks the birds while they sleep. It does not remain on the birds during the day, but hides away in perch ends, crevices and between cages. A heavy infestation of red mite can cause anemia in adult birds and can steal enough blood from nestlings to kill them; mites also spread disease through the stock, since they introduce viruses and bacteria into the bloodstream with every bite and transfer them from one bird to another. After a blood-meal, the female mite lays its eggs in crevices; these become adults in a week or so and the cycle begins again. Since each female lays hundreds of eggs, a huge population can develop in just a few weeks. A good way to look for mites is to place a folded tissue or newspaper between two cages and then check it for mites after a day or two; if mites are present, they will be seen scurrying for cover when you unfold the paper. Similarly, an inspection with a pencil-torch at night will reveal mites running along the perches if they are present. A magnifying glass is a really useful tool, especially for those of us whose eyesight is not so good. The red mite can survive without feeding for up to five months, so it is vital to be careful with second-hand sheds, cages, carrying boxes or perches. Think twice before you borrow carrying cages, and preferably use disposable boxes when you purchase stock from another breeder. If you do buy second-hand cages, all bare wood should be sprayed with a persistent insecticide like Malathion and all cages or show boxes should be blow-torched, sprayed and re-painted. 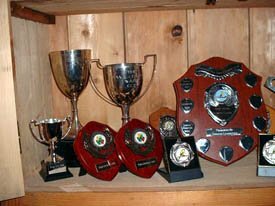 Quarantine for any new birds or second-hand equipment is the absolute principle which should guide all stock management. 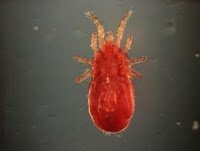 The Northern Fowl Mite (Ornithonyssus sylviarum) often called ‘Northern Mite,’ is arguably a worse pest than the Red Mite because it actually lives on the birds and never leaves them. It is most often found on the feathers around the vent and near the root of the tail, by the preen-gland, but it is very small, and a hand lens is often required to find it. Treatment is by pyrethrum based aerosols like Anti-Mite and dusting powders like Rid-Mite, both of which are extremely safe. 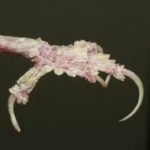 The Scaly Leg Mite (Knemidocoptes gallinae) is a parasite that burrows in the flesh under the scales of bird’s feet and legs, causing the scales to thicken and protrude. If a bird’s feet are crusted with thick scales and there is a chalky white deposit beneath them, it is almost certainly infected. The white powder is actually the mite’s excreta. Robert Stroud, the ‘Birdman of Alcatraz’ wrote in his classic ‘Digest on the Diseases of Birds,’ that there was no excuse for ever allowing this parasite to exist in the birdroom because treatment was so simple. He recommends massaging the bird’s feet with a little cooking oil – which blocks the mites breathing tubes and suffocates them. The treatment must be repeated a week later, to kill any mites that have hatched in the interim. I find that spraying the bird’s feet close-up with aerosol pyrethrum, so that they are wet with the liquid, also works well. 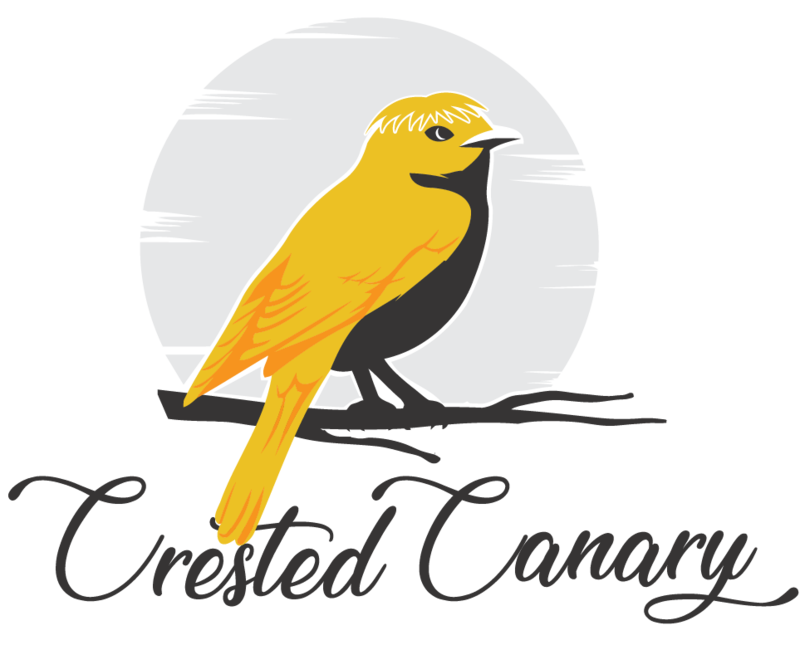 The Canary Lung Mite, (Sternostoma tracheacolum) – known in America as the Air-Sac Mite, is a parasite which infests the trachea, lungs, and air-sacs of canaries and finches, particularly Gouldian finches. The Lung Mite lives and breeds on the inner surfaces of the breathing system, including the trachea, sinuses, syrinx (voice box), bronchial tubes, lungs, and air sacs. The mite completes its life-cycle in two to three weeks, and it is unusual in that the female does not lay eggs but gives birth to larvae which are immediately independent. Birds which are affected gape and have difficulty in breathing; their gasping often has a typical clicking sound. Other symptoms include loss of song, coughing, the discharge of mucus from the nostrils, tail bobbing, weakness, and weight loss. Badly affected birds can die from the mucus in their lungs and the blocking of the bronchial tubes. In America and Australia, there is a large amount of information about this parasite, but I have never seen it described in an article in the UK; however, the Scottish Veterinary Laboratory near Edinburgh confirmed that it is ‘regularly found’ in bird post-mortems. So perhaps we should be taking a closer look at our canaries, finches and other birds. The treatment most often used here in the USA is the application of dilute Ivermectin fluid to the skin between the shoulders of the bird. Another group of lesser-known pests is the grain or flour-mites which do not attack birds directly but infest both seed and the floor coverings of bird cages. 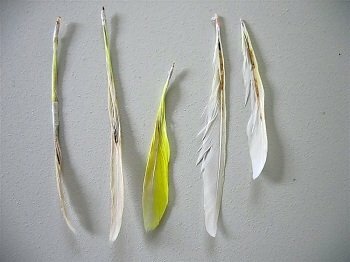 Recently my own birds suffered an infestation of these creatures, which do not harm the birds, but they can make the bird-keeper quite ill.
During warm weather in June last year I noticed that within minutes of entering the bird room I had difficulty in breathing, and my eyes began to itch unbearably. An investigation revealed huge numbers of very tiny, dust-like mites, living in the sawdust of the cages. They seem to thrive on waste egg-food and were most common where baths had been placed on the cages, resulting in damp sawdust. The most common member of this family is the Grain Mite, Acarus Siro. Which feeds on damaged grains but cannot penetrate undamaged seed. Populations of this mite can explode if it has access to egg food, wheat germ, yeast, cheese, powdered milk, flour or seeds. I was amazed to find that a box of Belgian ‘pigeon yeast’ that I bought was literally heaving with mites because I had stupidly left it open over a period of a couple of weeks. Birds which eat egg food, or seed, infested with mites may go off their food and will suffer from diarrhea, gut inflammation and impaired growth. Interestingly, I have found that many older fanciers admit to having had problems with this mite, but I have never seen any discussion of it in Cage and Aviary Birds. The key conditions which trigger a population explosion of the grain -mite include dampness and high humidity, (above 15%), warmth and supply of seed, cereals and egg food. These conditions often occur in breeding cages during a warm summer, especially if sawdust or shavings are used as deep litter and birds are allowed frequent baths. I feel we need a new design for a cage-bath which does not allow water to be splashed into the cage where it dampens the sawdust and creates the perfect breeding environment for the grain mite. The only remedy appears to be scrupulous food hygiene with the frequent and regular cleaning of the cages, which should be sprayed with Anti-Mite whenever the sawdust is changed. Also, as a general preventive, there is a spray containing Methoprene – variously marketed as ‘Zodiac,’ ‘Frontline’ and other brand names. Methoprene is a very safe chemical which interferes with an enzyme which insects need to develop properly; it prevents mites maturing into adults. This can be sprayed onto cage floor coverings and allowed to dry before birds are given access to food. The most important thing we can do to protect our birds from mites is to prevent them from ever getting into the birdroom in the first place. The principle of quarantine is the most effective measure that we can take, but it requires self-discipline and consistent management. The main avenues by which mites gain access to stock is via second-hand or borrowed equipment: sheds, cages, carrying boxes, show cages and even cardboard boxes used for transporting birds; all are capable of bringing mites or their eggs into your birdroom. All second-hand or borrowed equipment should be sprayed with a pyrethrum-based aerosol to kill active mites, but this will not destroy un-hatched eggs. Cages should be blow-torched to destroy eggs and sprayed with a persistent insecticide like Malathion (Duramitex). Obviously, re-painting after spraying and blow-torching will give a near-absolute guarantee of protection. 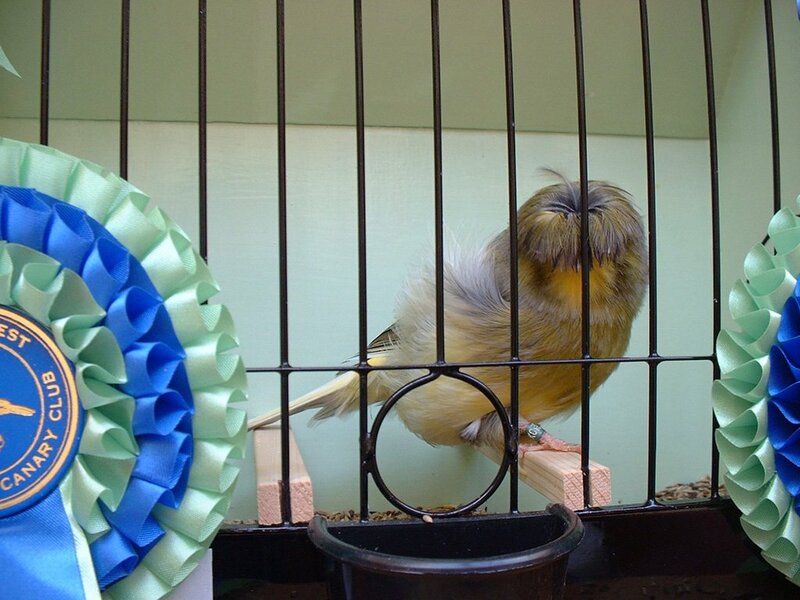 When birds return from a show, there is a good chance that mites can be brought into your birdroom, on the birds, on the cages, and in the show-cases. So a ‘mini-quarantine’ procedure should be used with show teams, at least spraying the birds and cages with pyrethrum. The second avenue is, of course, new birds themselves, which should never be brought into direct contact with your stock without a period of quarantine. New birds should be closely inspected for feather-lice, Northern mites, and scaly leg mites, before being purchased, in the original breeder’s premises. Holding the bird near one’s ear will also reveal the tell-tale signs of wheezy breath and clicking which should make you suspect Canary Lung Mites. Of course, if a bird has any of these indications, it would be best not to buy at all! 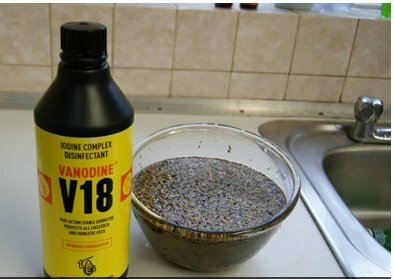 But even if everything seems healthy, you should spray and dust the bird with pyrethrum as soon as you get it home and place it in a quarantine cage, preferably in a different room from your main birdroom. The third avenue by which mites can get access is via wild birds which may visit your aviary, or as wind-blown migrants. If you have ever seen a barley field when a combine harvester is working, you will see clouds of dust billowing for hundreds of yards downwind. Millions of grain mites and harvest mites will be floating around in those clouds, and there is not a great deal you can do about it if you live in a countryside area.